Plans for the NRHT in Wayne County are in the investigative stages. 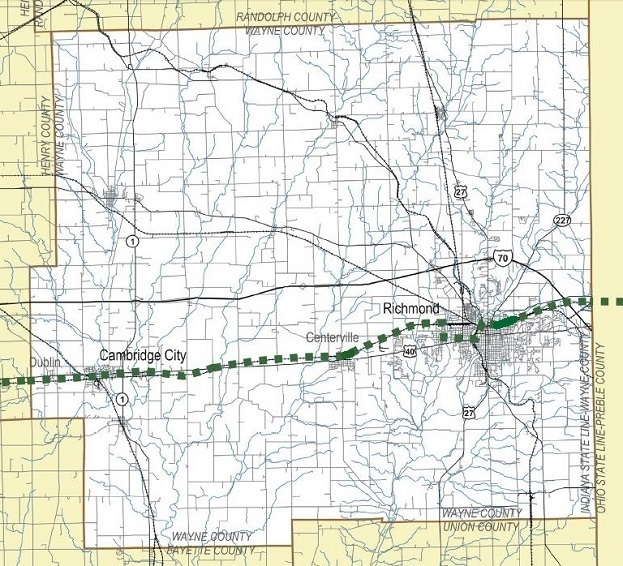 Outside of Richmond, the trail would pass very near the headquarters of the Indiana National Road Association at the Huddleston Farmhouse on the west side of Cambridge City and would use the short section of trail already built by Centerville connecting a new neighborhood to the town center. Currently, there are only two short trail segments open along the NRHT route in Wayne County outside of Richmond. They are a 1/4-mile section of the hiking trails behind the historic Huddleston Farmhouse, headquarters of the Indiana National Road Association on the west side of Cambridge City and a 0.6-mile long paved trail in Centerville.